New Jersey Sen. Robert Menendez helped push a port security deal in the Dominican Republic that could be worth hundreds of millions to a company owned by friend and political fundraiser Salomon Melgen, the embattled Florida doctor whose offices were searched by investigators Wednesday, records show. Melgen, who gave Menendez two free trips to the island nation in 2010, took ownership two years ago in a port security company called ICSSI that was seeking to implement a $500 million contract in the Dominican Republic, the New York Times first reported. At a Senate Foreign Relations Subcommittee hearing on doing business in Latin America on Aug. 1, Menendez pressed administration officials on why they had not pushed for tighter security at Dominican ports, transcripts show. He referred to Melgen's company without naming it, saying, "You have another company that has American investors that is seeking to -- has a contract, actually, given to it by the, kind of ratified by, the Dominican Congress -- to do X-ray or all of the cargo that goes through the ports," Menendez said. A spokesman for Menendez said his statement at the public hearing and his later calls to the State Department were routine. He said execution of the contract could help in the fight against the drug trade while also helping an American business. “Sen. Menendez has held several hearings where he has advocated for increased attention to the growth and impact of the narcotics trade on the countries of Central America and the Caribbean,” said Dan O’Brien, Menendez’s chief of staff. “Stemming the growth of narco-trafficking is a key challenge in the region, and it is a fight from which Sen. Menendez will never back down." Conservative watchdog group National Legal and Policy Center alleges "Sen. Menendez was in a campaign to promote the interests of Dr. Melgen’s company," even though Melgen has "no background in port security." 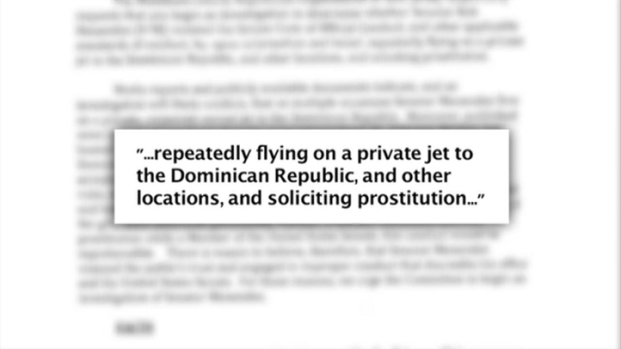 Menendez this week paid Melgen $58,000 for the free private jet flights he took to the Dominican Republic more than three years ago. O'Brien has said not paying for those trips was an "oversight." O’Brien said that after a review spurred by an ethics complaint launched by Republicans, Menendez wrote the $58,500 check to Melgen’s company from his personal account. Under Senate ethics rules, senators are allowed to accept gifts from personal friends, but any valued at more than $250 must be publicly reported and approved by the Senate Ethics Committee. Melgen's offices were searched by the FBI in connection with ongoing investigations. Melgen denies any wrongdoing.